UP TO 100 CHILDREN CAN PLAY SKILLASTICS® AT ONE TIME! THE #1 PHYSICAL ACTIVITY & SPORT SKILL DEVELOPMENT RESOURCE FOR LARGE GROUPS! Easy to set up & teach, the innovative Skillastics® method has helped thousands of instructors effectively organize and teach fitness and sport-based skills. 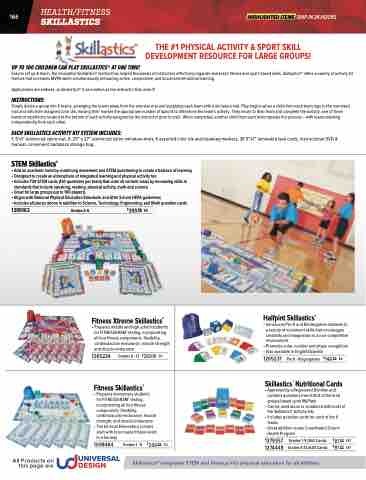 Skillastics® offers a variety of activity kit themes that increases MVPA while simultaneously enhancing active, cooperative, and social and emotional learning. Applications are endless, as Skillastics® is as creative as the instructor that uses it! Simply divide a group into 6 teams, arranging the teams away from the oversize mat and supplying each team with a miniature mat. Play begins when a child from each team jogs to the oversized mat and rolls their assigned color die, moving their marker the appropriate number of spaces to determine the team’s activity. They return to their team and complete the activity, one of three levels of repetitions located at the bottom of each activity assigned by the instructor prior to start. When completed, another child from each team repeats the process – with teams working independently from each other. 1, 5’x7’ reinforced nylon mat, 6, 20” x 27” reinforced nylon miniature mats, 6 assorted color die and beanbag markers, 26 5”x7” laminated task cards, instructional DVD & manual, convenient backpack storage bag. Skillastics® integrates STEM and literacy into physical education for all abilities.